Fans of cancelled Caprica will get to see the remaining handful of episodes. They’ll begin airing on Tuesday, January 4th at 6pm reports EW. The series was cancelled by Syfy last month and the network said at that time that the remaining episodes would return in the early part of the new year. The Battlestar Galactica prequel was a departure from the sci-fi action series and didn’t measure up in the ratings. The cable channel has given a greenlight to another prequel series that will be closer in tone to the original and is tentatively called Battlestar Galactica: Blood & Chrome. Of the Caprica cancellation, executive producer David Eick told EW, “I understand that these are rarely simple decisions and I know the current leadership at Syfy genuinely loved the show and were hell-bent on protecting it and seeing it succeed… Caprica was an extremely smart, unique show and it’ll take quite some time for me to get used to the idea that it’s really gone. What do you think? Glad to hear you won’t have to wait long to see the final episodes? Do you think elements of Caprica should be worked into the new series? 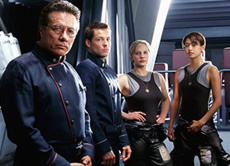 More about: Battlestar Galactica (2004), Caprica, Caprica: canceled or renewed? Ahhh…everytime I find a show that is intriguing and makes you think about life and the future as it may come to pass..it gets cancelled. I really liked this show. Like an onion it was unveiling what life may come to in the future. Be aware people of how the future may come about..This show was showing how mind droning life is becoming. Where we seek solace in games and virtual reality then in the one who sustains all life…Jesus Christ our Lord and to God to whom we should find all satisfaction. I feel devastated at the loss of Caprica. It was finally a storyline addressing the very real likelyhood of mind-uploading and what many see as the next stage in human evolution. Endless possibilities to explore on that concept. Or in other words a real chance to explore the potential of practical open-ended lifspans rather than the fantasy religious promises and supernatural nonsense that CptnEdge references as if such things are real. SyFy finally got something right and they cancel it. It was real SYFY. Most of their crap is just that crap, not Syfy, therefore not worth watching. I watch two things for the most part (except Chuck) syfy and news (information type of programing) they can drop dead. It was cancelled because Caprica was BORING. Here they have this chance to show the early robots kick some @$$ and all they do is show boring holodeck like stuff ala Star Trek Next Generation. They had a great opportunity and blew it. Hopefully they learned their lession and do better with the next installment BSG: Blood and Chrome. Total disappointment. This is a great show. Mainstream TV is pushing us to the Internet. Such mindless shows on now. Shame. So disappointed with syfy channel. They cancel a cutting edge show like Caprica but will keep airing crap like anaconda! Ratings may have been low for a bit but get serious, it takes time to win back viewers who are intelligent and tired of being fed brainless entertainment! Syfy you have lost this viewer for good! Really sad to see it go. A very intelligent show with layers like an ogre! With the rise of reality TV for the retarded masses, there seems to be no room for shows that require imagination and ingenuity. What, are we supposed to believe they can’t do both shows? With the rest of their programming, case in point the arrival of rastlin’, ScyFy could afford to continue a very deep series which could have been given at least more season to come to some satisfying conclusions, while exploring science fiction that we ourselves may be forced to face one day. 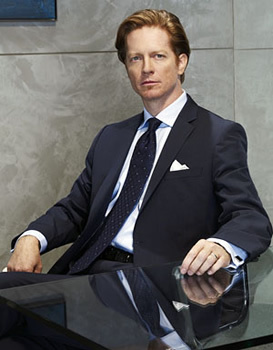 Caprica should get at least one more season, all that big talk about giving it a chance – whatever. What I don’t get, is that SYFY is a cable channel, it doesn’t need advertising to stay alive – but yet they invest in shows like Warehouse 13 which look and play like a show made 25 years ago. Here’s an idea, why not do a Caprica mini series that takes us to the Cylon War? So disappointed – can’t believe Caprica was cancelled. I did think it moved a little slow and needed to move on to evolving the cylons….I am so tired of all the CSI’s and Law and Orders – Caprica was truly entertaining. Sorry to see it end. I’m sickened by the canceling of Caprica. Finally a really well done thought provoking series but not enough mindless car chases and violence or middle class living for the American public? Why does SYFY have to go for the lowest common denominator? I’m sure it would have gathered more momentum through word of mouth and more publicity given more time. Execs need to know that we the watchers (customer) are getting tired of investing time into a series only to have them canceled. Maybe they should put more into keeping a series rather that jusn bailing on them mid stream. I will think long before locking into another Syfy series. Hey advertizers what if I waited a year to watch the next SyFy series to confirm the Execs confidence in its viability. Just so everyone knows the second have of season one is available on amazon.com for pre-order for a December 22, 2010 release! -So you can see the episodes even sooner! I liked the series; it wasn’t BSG, but it was better than a lot of shows out there. I was disppointed at its disappearance, and with SyFy. I used to watch SciFi all night Friday. Now, I am lucky to turn it on for Tuesday’s SG Universe and Friday’s Sanctuary. I can’t for the life of me explain the existance of wrestling on a “Science Fiction” channel. Eureka is (was?) good, Haven was OK so I will keep an eye out for them when/if they come back.